﻿ VI. Read the passage and answer the question: How has the classical drawbridge been improved? The drawbridge or bascule, originally used for protection against intruders, has been turned into a means for allowing the passage of water traffic. The classic drawbridge, in which the bridge leaf is hoisted by rope or chain, has been improved by the development of pears and counterweights. Design variations include leaves that roll back on tracks, bridges whose entire span is lifted vertically by cables run over tall towers to counterweights and bridges that swing on a central turntable. Viaductis like a bridge, except that it crosses over dry land instead of water. Some viaducts do cross water, but they also cross dry land instead of merely extending from one bank to the other as a bridge does. Most viaducts consist of a series of supports under beam-and-slab or arch construction. Viaducts carry railroad tracks over valleys and gorges. Some viaducts are built higher than the general level of the land to carry railroads over highways or to make a safe crossing for highways over railroads. The ancient Romans built the first viaducts. The aqueducts they built to carry water to cities often also served as roadways. One of the longest viaducts ever built was a portion of the 110-mile (177-kilometer) Key West extension of the Florida East Coast Railway. Viaducts that extended over the open sea formed 30 miles (48 kilometers) of this extension. Parts were destroyed by a hurricane in 1935, but these were rebuilt as a highway a few years later. The main part of the pier viaduct over the mouth of the River Tay in Scotland has 84 steel spans and is over 2 miles (3.2 kilometers) long. The Tunkhannock viaduct on the Lackawanna Railway is one of the largest steel and concrete viaducts in the world. The Tunkhannock viaduct is 2,375 feet (724 meters) long and includes 10 spans of 180 feet (55 meters) each. Another famous viaduct is the 3-mile (5.6-kilometer) Pulaski Skyway between Newark and Jersey City. Other well-known viaducts are the Pecos River viaduct in Texas and the Landwasser viaduct across Albula Pass, in the canton of Craubunden, Switzerland. Historically, many agricultural societies have constructed aqueducts to irrigate crops. Archimedes invented the water screw to raise water for use in irrigation of croplands, Another widespread use for aqueducts is to supply large cities with clean drinking water Some of the famed Roman aqueducts still supply water to Rome today. In California, USA, three large aqueducts supply water over hundreds of miles to the Los Angeles area. Two are from the Owens River area and a third is from the Colorado River. In more recent times, aqueducts were used for transportation purposes to allow canal barges to cross ravines or valleys. During the Industrial Revolution of the 18th century, many aqueducts were constructed as pan of the general boom in canal-building. In modern civil engineering projects, detailed study and analysis of open channel how is commonly required to support flood control, irrigation systems, and large water supply systems when an aqueduct rather than a pipeline is the preferred solution. The aqueduct is a simple way to get water to other ends of a field. In the past, aqueducts often had channels made of dirt or other porous materials. Significant amounts of water arc lost through such unlined aqueducts. As water gets increasingly scarce, these canals are being lined with concrete, polymers or impermeable soil. In some cases, a new aqueduct is built alongside the old one because it cannot be shut down during construction. The Central Arizona Project Aqueduct, the largest and most expensive aqueduct system ever constructed in the United States. 1. Viaducts like bridges cross water. 2. Viaducts cross water and dry land instead of merely extending from one bank to the other. 3. Viaducts carry railroad tracks over valleys. 4. Viaducts are built on the same level on the land to carry railroads. 5. The Greeks built the first viaducts. 6. Parts of the longest viaducts were destroyed by an earthquake in 1925. 7. The spans of the viaduct over the River Tay are over 2 miles long. 8. Many agricultural societies have constructed aqueducts to supply large cities with water. 9. The famous Roman aqueducts were ruined long ago. 10. In California large aqueducts supply water to New-York. a) water b) dry land c) cross water and dry land. 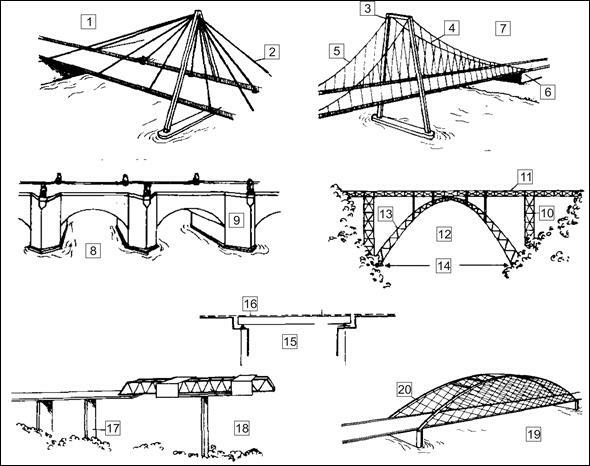 a) beam construction b) arch construction c) beam-and slab or arch construction. a) 2,375 feet long b) 1,947 feet long c) 2,357 feet long. a) concrete b) polymers c) dirt. a) alongside the old one b) over the old one c) under the old one. 1. What do viaducts cross? 2. What do they carry? 3. Why are some viaducts built higher than the general level of the land? 4. What did the ancient Romans build the first viaducts for? 5. What are the longest viaducts? 6. What is the use of aqueducts? 7. What were channels made of in the past? 8. Why is in some cases a new aqueduct built alongside the old one? 1. Type of long bridge or series of bridges, usually supported by a series of arches or on spans between tall towers. The (путепровод) is both functionall and etimologically (относился) to the aqueduct, which (переносят) water; both were developed by Roman engineers. In the early of 20-th century the spread of (железо-бетонных) (конструкций) led to the building of concrete (арочных) structures such as Colorado Street viaduct over the Pasadena Freeway in California. A recent method used on long viaducts is (сегментная конструкция). The (водоснабжение) in New-York City comes from Thee main (система акведуков) that can (поставлять) from 1 800 000 000 gal. of water a day from (источников) up to 120 miles away. (Cистема акведуков) in the State of California is by far the largest in the world. 1. The long spans of Roman viaducts were supported by semicircular …, resting on piers of stone or masonry. 2. A well-preserved example is the … over the Tapus River. At Alcantara, Spain. 3. The next advance in viaduct … did not occur until the late 18-th century development of iron bridges and the 19-th century introduction of … . 4. In modern engineering aqueduct refers to a … of pipes, ditches, canals, tunnels and supporting structures used to convey water from its source to its main … . 5. Modern aqueducts, although lacking the arched grandeur of those built by the Romans, greatly … the earlier ones in length and in the … of water they can carry. Listen to the Webcast Britain in hot water over alleged Taliban meetings again and tick the correct answer. Read the following passage. Draw up a list of terms denoting the university teaching staff in Great Britain and in the USA. What are the corresponding Russian terms? Study the CV given below. Answer these questions.